Yesterday’s snowfall was pretty, but hard to clean up. I am really tired today from all the shoveling. Carol E of Giraffe Dreams has good photos of the snowstorm if you want to see. Now, the recently completed project that was just meh? It’s a rug. It does have some good attributes, so I decided to blog about it. 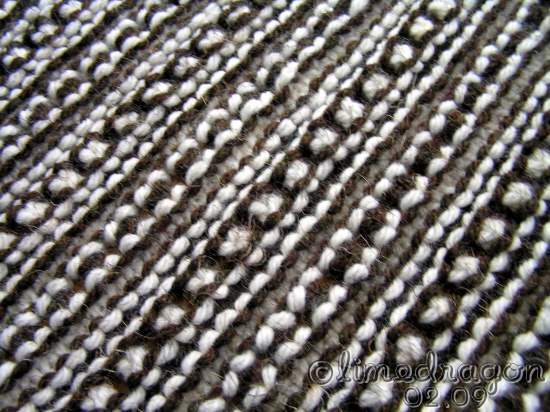 The textured stitch pattern was what was attracted me to the pattern. That, and Mom loves throw rugs that can be machine washed and dried. So, I had her pick out two colors for me to use. I love the colors, and I think they look great together without being boring. The texture on the Right Side, while busy, is fun and reminds me of chocolate truffles. But I must admit that I am quite partial to the Wrong Side, so smooth and plain! The two problems I had with this pattern? Gauge and bias. My gauge was way off, even when I went down a needle size. 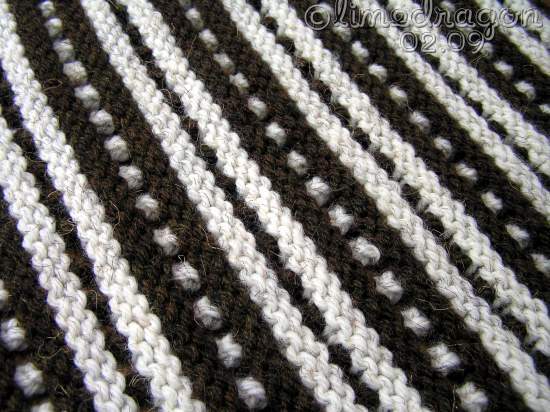 I stubbornly refused to use anything smaller, because of the bulky yarn. 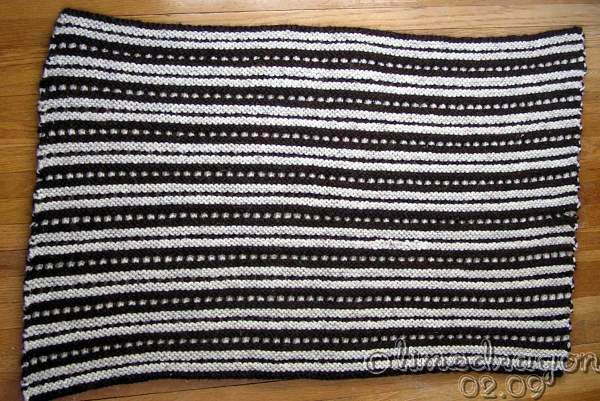 The rug turned out huge, width-wise. 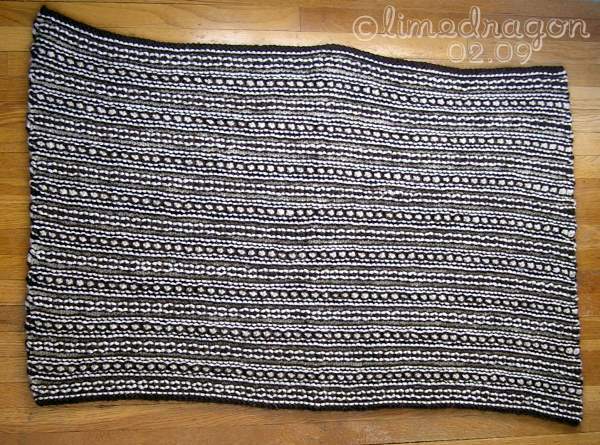 I ended up knitting less than half of the required length. In the end, even though the dimensions were what we wanted, I realized that my gauge was too loose. The rug was floppy and the rectangle I had was not at all rug-like. A stiffer gauge would have been ideal. I didn’t notice the other problem until it was too late. The eyelet rows are all worked with k2tog, so naturally, the sides bias slightly (as visible in two of the above photos). D’oh! This problem could be rectified by using ssk in alternating eyelet rows. I think it turned out well! But yeah, I can see the biasing issue. Pooey. Neil Gaiman had some good snow pictures, too. A handsome rug it is! Sometimes utilitarian projects seem so boring until you get them done and start using them. Then their value is appreciated. I really like it. I like the close-up photo. It would make a great desktop wallpaper. I like the rug. The pattern on both sides is nice. I can see what you mean about the bias though. i love that rug! seriously love it!